Vanilla... one of the most irresistible smells ever. Imagine baking without vanilla! That wonderful smell wafting in your kitchen and home, can there be a more welcoming aroma which can make your house smell like home? I love vanilla and whenever I see the little black bottle in my fridge, I feel like baking. Agreed, we have grown up seeing and eating goods baked only with synthetic essence, but vanilla is vanilla. Vanilla extract in stores in India, is one of the many many baking ingredients unheard of. Except in very rare specialty stores. 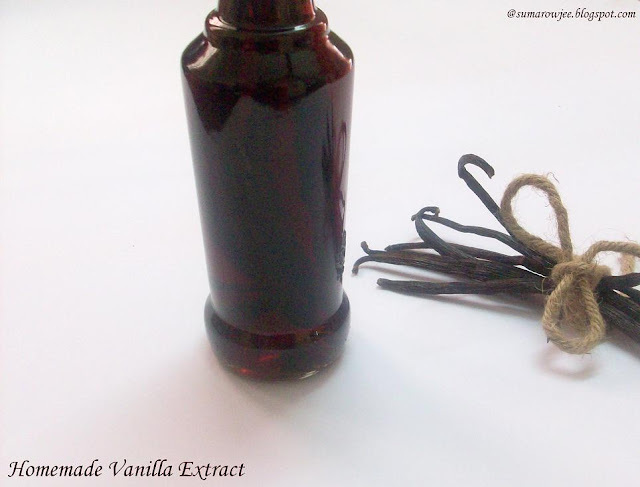 I have been using synthetic vanilla essence since the time I have been baking. I have used a couple of bottles of pure vanilla extract a few years ago, when I was not yet obsessed with baking and did not even know that there is something called as pure vanilla extract. Oh boy! I did not realize that what sis-in-law has sent from the US was pure vanilla extract! I used it freely in my cakes, but not without realizing that it was indeed imparting a very different taste to the one and only sponge I used to bake rarely. And then I realized that vanilla extract is indeed special. Vanilla is supposed to the most expensive among spices, next only to saffron. The reason being extensive labor needed to cultivate the pods. Dark, shiny, plump and moist are the kind of beans which are of good quality - as opposed to the thin, shriveled and dry ones. They are sometimes coated with a white substance, they are vanilla crystals. 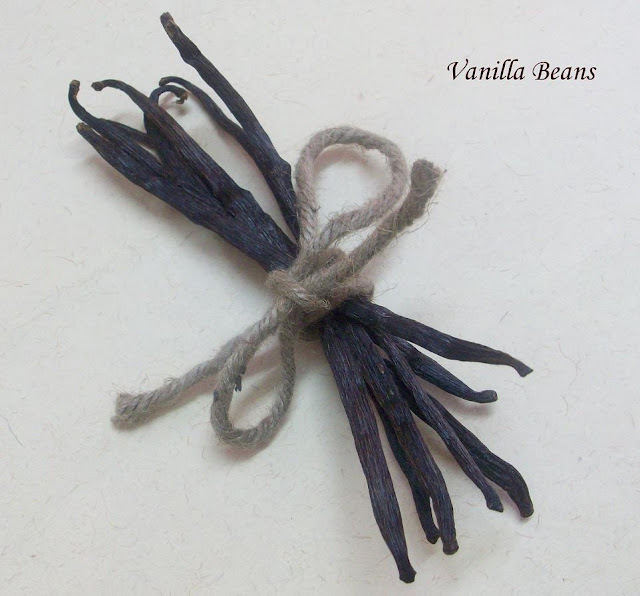 Vanilla is available as pure extract, pods and vanilla powder. The bean is split into two and the tiny seeds are scraped out and added to cake batter, ice creams, custards etc. The beans can be dunked into milk, custard etc to infuse the flavor. Then the beans can be rinsed, dried and buried in sugar to gradually infuse the flavor into sugar, giving you vanilla sugar. The best beans come from Tahiti, Madagascar and Mexico. Tahitian beans are supposed to be the most aromatic ones and larger in size too, hence less of it needed in a recipe. Source - Rose Levy's Cake Bible & Wikipedia. And it was a discovery to see home-made vanilla extract on Deeba's and then on Shaheen's blog. Fabulous! Sounds so very easy! Split vanilla beans and dunk them in vodka for 6-8 weeks and your extract is ready for use! Yes, I made my Vanilla Extract at home! 24 comments: Labels: How To..
Like a lot of us, I love to read food and baking books. I buy some, borrow some from the library and some from friends. Oh yes, am quite greedy here! I own a handful of books, out of which more are about desserts or about baking. In my opinion, most baking , however healthy, is only relatively so, hence can't obviously eat these on a daily basis. I confess that my everyday food more or less revolves around a very familiar, boring menu. I love to spend time on new bakes, desserts and snacks for the kids, but when it comes to everyday food, I treat it as something to get over and done with as early as possible in the morning. It fails to pump that adrenalin in my blood like baking does. My growing boredom with the food I cook (sounds familiar?) leads me to think I must introduce more variety in our everyday meals, without that overload of calories and fat. And I recently realized that I must get more books on healthy everyday food too, rather than more and more baking books. Of course there is the internet always, but books are books. Period! Can you imagine anything better than curling up on the couch with a good food book for dessert? One of the most blissful things in life...Even better when the book can give you interesting, doable and easy low calorie recipes for everyday food. Makes cooking your everyday meal less monotonous. I like this book by Sanjeev Kapoor titled 'Low Calorie Vegetarian Cookbook'. Which is your favorite book in this genre? I remember watching the movie Masoom all those years ago when the kids were still not in the scene. I dare not watch that movie now, as I am very sure, Jugal Hansraj will leave me more than a tad misty eyed ... being a parent makes you relate to the innocence of childhood and that over-whelming parental love. If you are already a parent and you have watched Taare Zameen Par- you have heard the joke- you will not yell at your kids for one full day after watching the movie:-) When the kids are ready to do anything to make you smile at the sight of your crest fallen face, it makes you cry. When you are ready to throw anything at them just for a moment of much wanted peace, that makes you cry too, albeit in a different sort of way:-). Do you like what you see here? Please tell me that you do, and it looks like I have put in a lot of effort, it looks like its been baked by someone who's been baking breads for years! Because I did not! I mean I am new to baking breads and haven't baked scores of them, well, not just yet! And I definitely did not need to knead it with a stop-watch beside me. 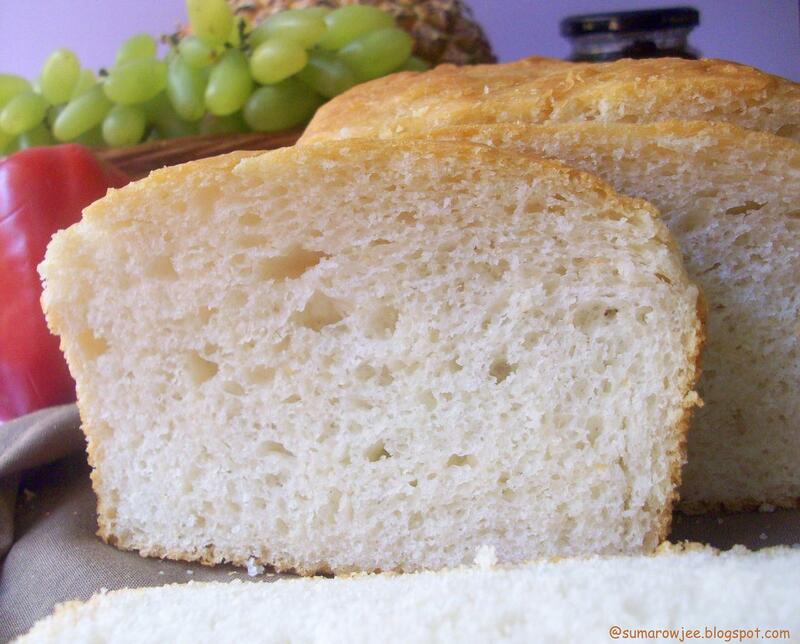 Yes, this is another no-knead bread or a batter bread. No-Knead Spicy Buns were a revelation, getting great bread with almost no effort. That bread made me lazy...and then I came across this recipe on Allrecipes.com and decided to see how laziness would look in a loaf. And I must say, the bread came out pretty good! Its kind of funny... people usually start baking with brownies first and then go on to bake cakes, cookies, gateaux, breads etc. But yours truly did it the other way round. 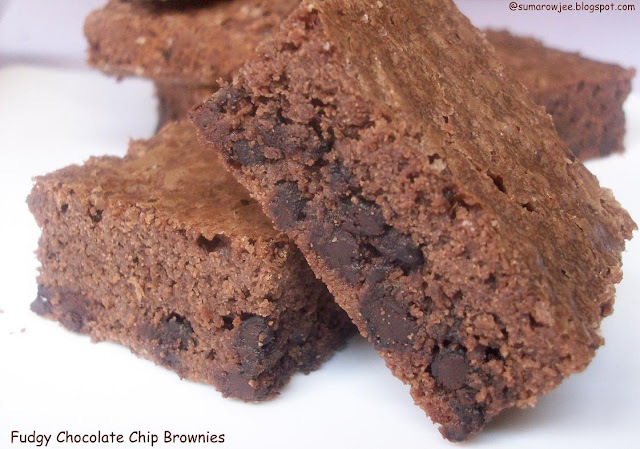 I may have baked brownies only twice or thrice and that too after I started to blog. Sounds weird right? In case you blinked and missed the only other brownie recipes on my blog, here they are - Seriously Low Fat Brownies - kind of cakey brownies, but healthy and tasty. And Instant Microwave Brownies - warm and fudgy. The brownies turned out fudgy, very chocolaty and tasty - just the kind of brownie recipe I was looking for..
Of course I have been baking! I mean I know bakes have been conspicuous by their absence on the blog for some time…Wait let me check the date… gosh! Has it been only a week since I put some muffins here? I was pretty sure it had been ages! Whew! Tell you what, I feel like baking every single day and I am sometimes very sure I must be crazy to feel this way. And it really does come as a relief to know that there are more folks like me out there. Thank God! But then I am definitely not thanking God for making too much carbs not good for health, for making me crave for dessert after every meal, for not making cakes, ice-creams and cookies health food. Aaaw God, be fair!! Am not thanking you for making me gain pounds by just looking at cakes, for making butter and oil very much part of baking, baking for the sweet tooth to be precise. Admit it !- You can almost picture me kicking my legs and going on like a brat, but then some things in a baking-obsessed foodie’s life are just not fair!! But then like all things in life that must go on, I must bake everyday (well, almost!). Even if it means eating just a piece of the tray of decadent brownies and sending it off for others. (Hubby and kids sometimes don't even realize that the tray was full just before they came home;-) Even if it means finding low-fat, no butter treats which can satiate the sweet tooth and help me scratch the itch to bake. 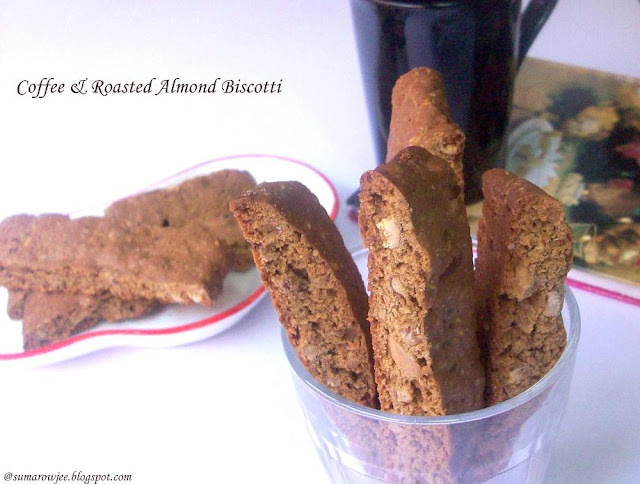 Half a recipe of Coffee and Roasted Almond Biscotti did just that to me. Crunchy, rich with the aroma of coffee and just about sweet – a perfect low fat treat! Oyster Bay - Food Tasting And Review..
An invite for food tasting at a new seafood restaurant for a vegetarian? Something that intrigued me. Being a vegetarian, I have the usual reservation to eat at a seafood restaurant as it’s not really a pleasant experience. The smell of seafood can be quite over-powering and can kill the pleasure of eating the best vegetarian fare. The tasting was to be held over the weekend, some of us invited on two different days. It would have been real fun to meet everyone on the same day, but could not happen so. 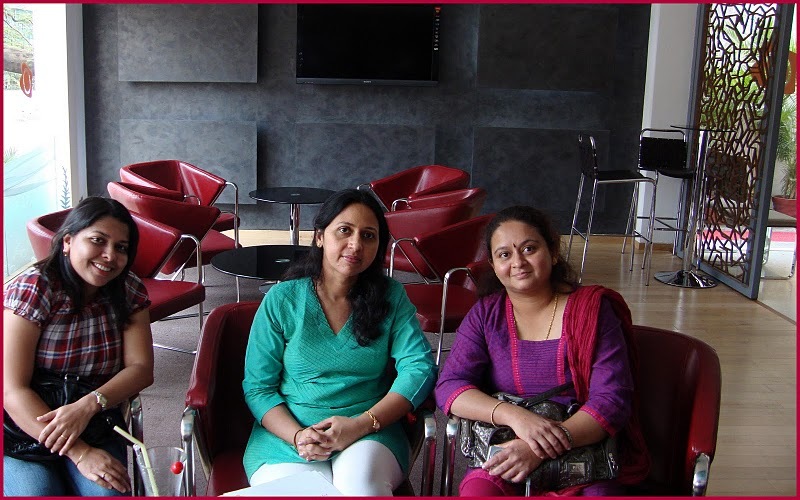 I was looking forward to meeting fellow bloggers Sweata, Reshmi and Shreelakshmi as I had not met them before. Miriam could not make it unfortumately, would have loved to meet her too..
Dimna from PRHUB had reassured me that they very definitely meant to invite vegetarians too for this meet. But there was still that niggling thought in my mind as I set out to Oyster Bay on that Sunday after-noon. Kids at home with hubby and the restaurant being very close to my place was a consolation. Oyster Bay is located at Koramangala, next to Bhima Jewellers, Jyothi Nivas Road. Its a division of Penver Products Private Ltd, a renowned sea food processor based in Cochin. One of thier biggest USPs they claim is the really fresh sea-food they bring to the table. The sight of the bright and sunny lounge bar was an instant pick-up as were the cheerful smiling faces of Dimna, Sweatha and family. Its feels surprisingly good when people relate to your blog name and then to you, I realized! But then we were not really strangers as we have virtually met courtesy the amazing blogosphere. The lounge bar almost brings in the outdoors and we enjoyed our mock tails, while we chatted away waiting for the others to arrive. My Virgin Pina Colada was extremely refreshing and it was a pleasure to sip on it. A growling tummy is not most conducive if I must be good company! When Dimna asked if we were hungry, we all echoed a resounding 'yes!!' and she had to agree that it was the wrong question for foodies:-). We are shamelessly, perennially hungry! We moved into the dining area, very well done with a subtle hint of sea in the paintings and the rest of the decor. The restaurant is quite spacious with a good seating capacity, an open kitchen and a small buffet area and a chocolate fountain. The very efficient air-conditioning gives absolutely no scope for any smell of sea-food, much to the vegetarian's delight. We asked for a sampling of all the starters in the menu of the day. We were first served a simple amuse bouche, chick peas and olives in mayonnaise based sauce. We then had Cajun Spiced Aloo Tikkis, Crumb Fried Paneer and Jalapeno Poppers. I liked the way the food was plated and of course the lovely platters too...the platters have been specially sourced and hand picked by Mr.Thomas, the MD. The soup comes with a small side dish like mini paratha pizza and the kind, which makes the soup a mini quick meal in itself. The Jalapeno Poppers - gooey melting cheese encased in crispy covering was a dish worth mention. The Crumb Fried Paneer would have been fabulous if the paneer had been really soft. The Coriander & Corn Chowder with Nachos - the only vegetarian soup on the menu - can be described as an interesting soup with the unmistakable taste of coriander seeds coming through. The incorrigible dessert lovers we all turned out to be, we requested for a sampling of all the desserts on the menu. I particularly liked the Missisippi Mud Pie and the Walnut Brownies. There was also Goan Bibinca and Lytichie Bavarian. The Tiramisu was disappointing though, probably my expectation of the dessert was too high..
From left to right.. Reshmi, yours truly and Sweata..
My Opinion: The concept of a sea-food restaurant offering to cater to vegetarians is extremely good. The vegetarian dishes on the menu though needs work both in terms of options and quality. The desserts - the part I tend to remember a meal by - also needs work. The ambience is great, service friendly, but more efficiency would be appreciated by the patrons. Mr.Philip Thomas, the MD promised more additions to the vegetarian menu. If you would want to eat only vegetarian food on the menu, you should visit the restaurant only after the additions are made. Our non-vegetarian companions were very happy with the food, so there- a good restaurant with good fresh sea food, priced reasonably- that's Oyster Bay for you! Thank you Mr.Philip for having us over, we had a whale of a time! Sincerely appreciate the thought for the vegetarians. Wishing Oyster Bay roaring success!! My special thanks to Reshmi for the pictures! 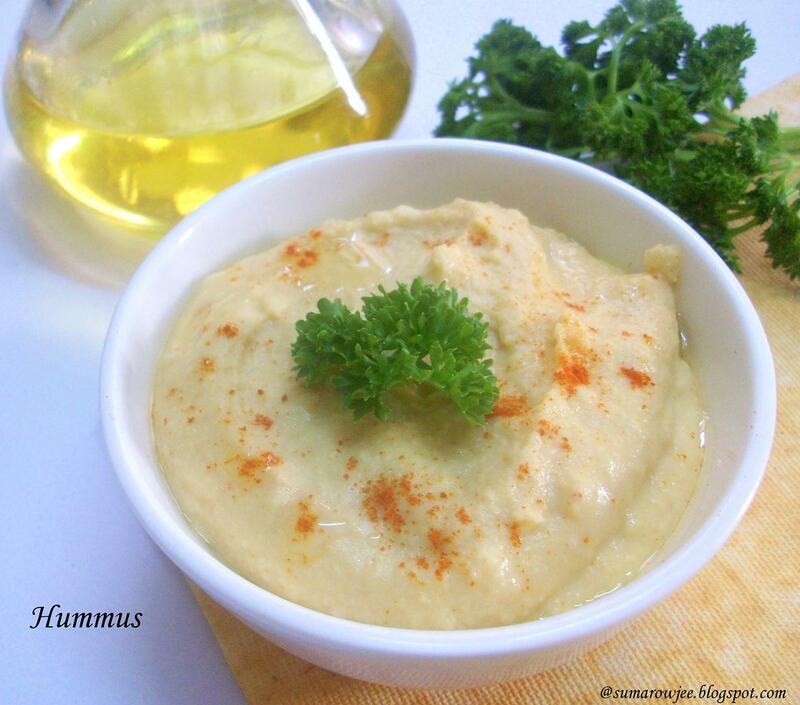 Hummus - one very famous Middle Eastern specialty dip. It’s also spelled as humous, humus, houmos etc. 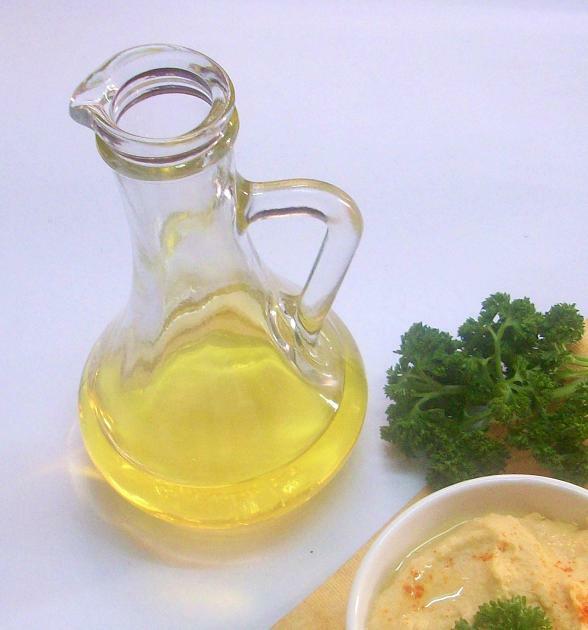 The basic ingredients are cooked chickpeas, olive oil, garlic, lemon juice and salt. Tahini or sesame paste is also added to the dip. Chopped parsley, cilantro, olives, jalapenos, caramelized onions, whole chickpeas, olive oil, boiled eggs, paprika, tomato and cucumber are some popular garnishes to the dip. 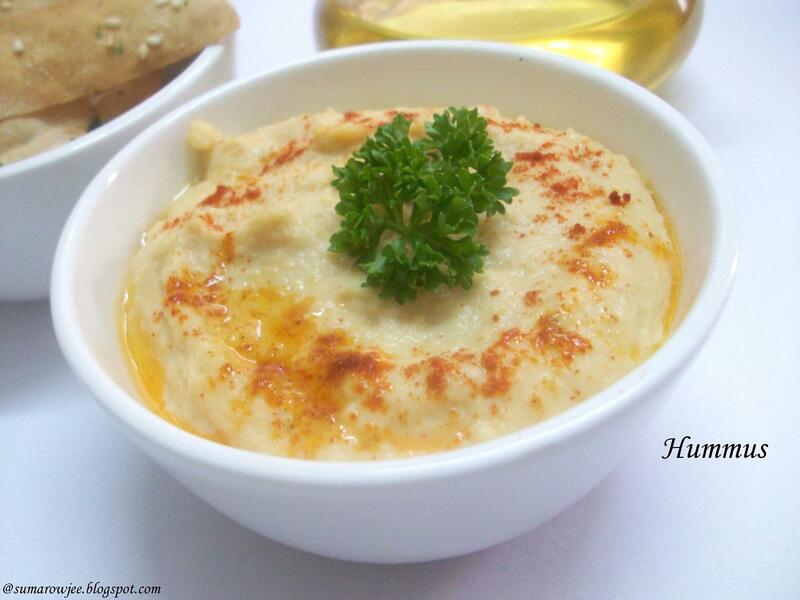 Hummus is served as an appetizer or as a dip along with pita bread or as part of a meze or as an accompaniment to falafel (patties made of ground chickpeas or fava beans). It’s also served with crackers or tortilla chips in other parts of the world. – Source, Wikipedia. I must confess, I am not much of an adventurous eater and hardly venture out of my comfort zone. Put the world cuisine before me and I am most likely to stick to just a few familiar ones I love to eat over and over again. Not very surprisingly, I never asked for my first taste of this lovely dip. But when I did taste it, I was surprised I actually liked it! I loved the creamy consistency, the flavor of olive oil and garlic in it. Discovered it’s quite easy to make at home and pretty versatile too, so had to try my hand at making this versatile dip. Here is how I made the dip. Recipe adapted from various sources. 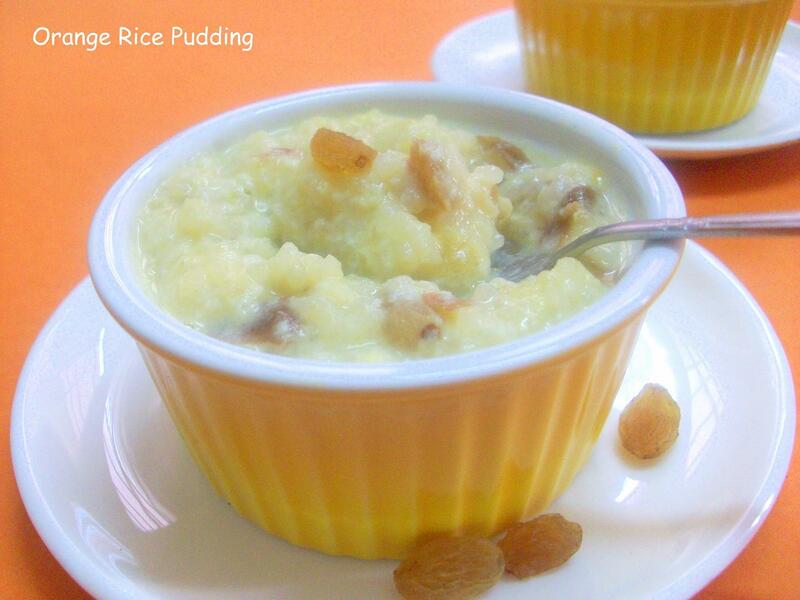 Apart from the basic ingredients, most of the other ingredients can be changed to suit personal taste and preference. So please do go by your taste. The below quantities, I realized, makes quite a lot of Hummus, say approximately 3 cups. Chickpeas: 1 cup, soaked overnight. Procedure: Cook the chick peas till very soft in a pressure cooker. I like to add a pinch of cooking soda to the peas when I cook them. Drain and cool the peas completely. Reserve some for garnish if using. Grind the chickpeas, roasted garlic, salt and ¼ cup of yogurt in a food processor or a mixie jar. Run for a minute. Add ¼ cup of olive oil, chilli powder. Process till smooth.. You could add more oil if needed. (Makes it more tastier of course! )Transfer the dip from the food processor. Add the lemon juice. Check and adjust seasoning. 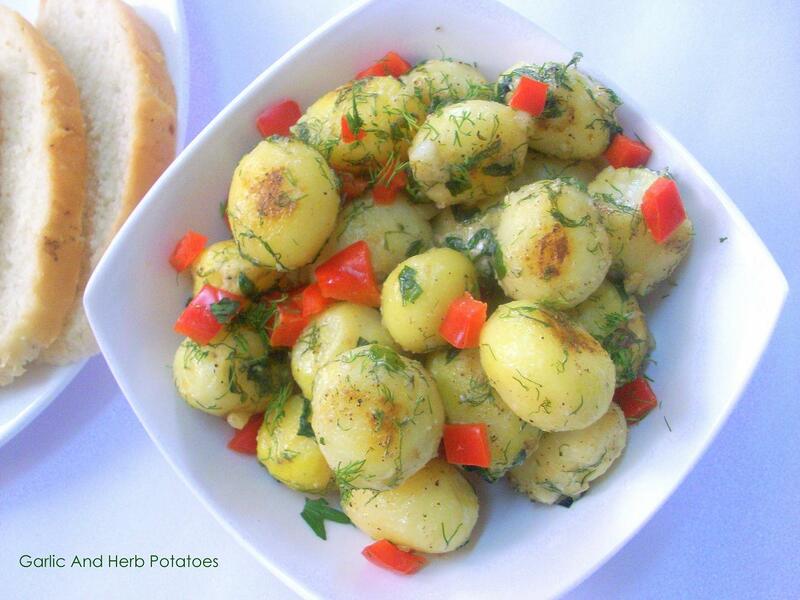 Add the chopped parsley and mix well. Add garnish of your choice. Now isn't that real easy? Of course canned chickpeas or boiled frozen ones can make this even more of a breeze. We ate the dip with some home-made crackers.